Choux (pronounced "shoo") is a type of rich pastry dough used for making items such as éclairs, cream puffs (profiteroles), gougères and beignets, among others. It is characterized by a crispy outer shell with a light, airy interior. 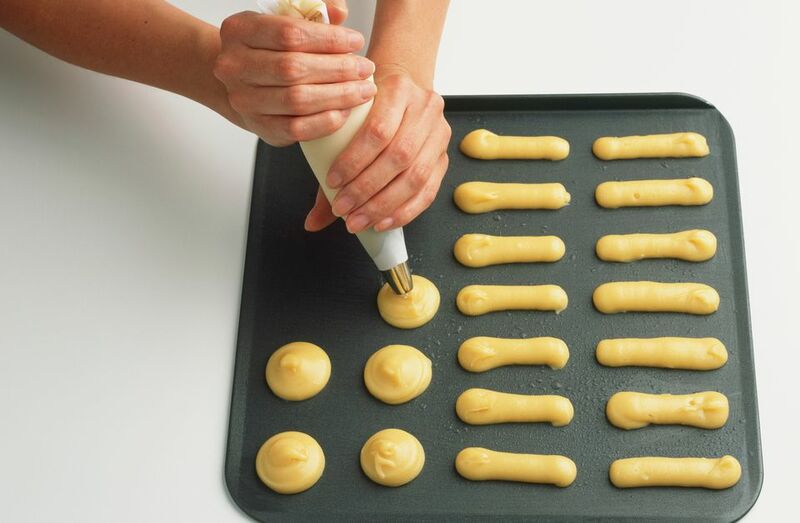 Choux pastry, also called pâte à choux ("pot-ah-SHOO"), is made with flour, butter, eggs, and water, although it can sometimes be made using half water and half milk. It is leavened with steam, rather than a chemical leavening agent such as baking soda or baking powder, or a biological leavening agent such as yeast. The dough is made on the stovetop, with the ingredients (except for the eggs) brought to a boil while stirring to form a ball. This is pretty unusual, since most pastry doughs are mixed and then rolled or folded, but not cooked. This double cooking helps to produce the airy interior. How that works is, heating the flour the first time causes the starch in it to gelatinize. That's the same principle that works when we make a roux to thicken a sauce. By gelatinizing, the starch helps support the structure of the gluten when the steam inflates it. This structure also helps hold in the steam. The first cooking also helps to denature some of the gluten molecules, so that the dough is less elastic. Instead of a new rubber band, which stretch and snap back, the molecules become like old rubber bands. They stretch but don't snap back all the way. So the steam pushes out the dough to form bubbles, and instead of snapping back right away, the bubbles stay stretched out. Meanwhile, the starch structure (as described above) helps support the bubbles while preventing the steam from escaping, thus keeping the air bubbles inflated while the pastry has a chance to set. Ta-da! When baking pâte à choux, the choux is baked first at a high temperature, and then finished at a low temperature. The high initial temperature in baking choux is what generates the steam to cause it to rise. The word choux in French means cabbage, and choux pastry gets its name from the fact that the little balls of choux paste used to make cream puffs resemble little cabbages.